Let us start with a scene of farewell. A son touches the feet of his mother as we see soldiers embark on the train to the front. The elderly father looks on as the mother wipes away her tears with her chunni (scarf ). Emotion is suggested through gesture and colour rather than through the art of close-up. White, the colour of mourning, visually unites the grieving parents and spills over through the world of fabric to a similar scene on the right-hand corner with two distraught women, suggesting a wider female community of mourning, before the white is carried over to the waiting train—the cause of the sorrow, the harbinger of death. 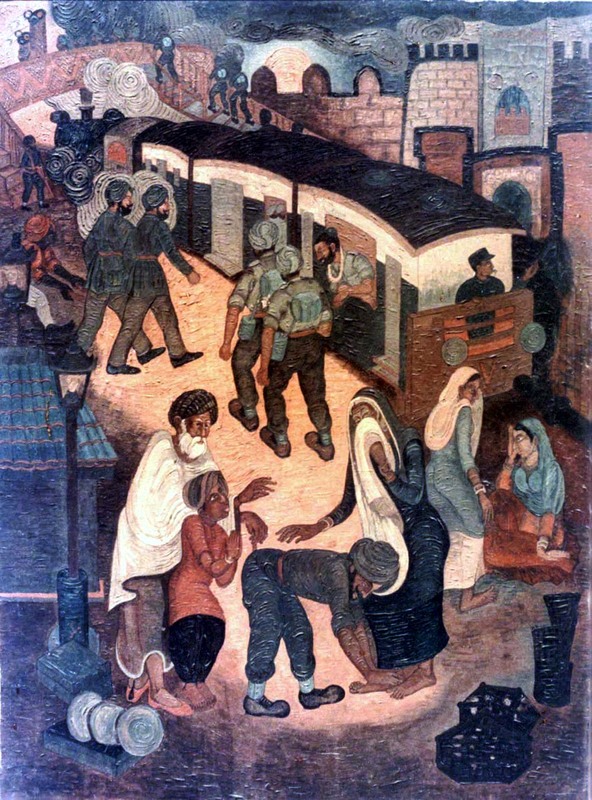 The painting, by the Punjabi artist Pran Nath Mago, is titled Farewell and was painted in 1945. The emollient contours and the flowing clothes of the civilian figures contrast with the Western military uniform and rigid gestures of the soldiers, while the three distant figures on a bridge amidst the billowing smoke of the train take the painting to a different place, different time—the world of no-return. The immediate trigger of the painting was the Second World War, but it was based on Mago’s childhood memories of soldiers taking leave at the Gujar Khan railway platform for the front during the 1914-1918 war. The painting fuses the two wars as both depleted Punjab of its young men. The painting lifts the veil on what still remains one of the weakest links in First World War history: the colonial home front. Of the over one million Indians who served abroad, some 480,000 came from Punjab. Of the over one million Indians who served abroad, some 480,000 came from Punjab. Lord Frederick Roberts—the Commander-in-Chief in India from 1885 to 1893—was an enthusiastic proponent of the theory of the “martial races” and reshaped the class components of the Indian army, in particular replacing men from the “unmartial” south with the “martial” races of the north. The army was further reorganised by Lord Herbert Kitchener, who became the Commander-in-Chief in India in 1902.